Titan Comics has released Minky Woodcock: The Girl Who Handcuffed Houdini #1. Titan’s Minky Woodcock: The Girl Who Handcuffed Houdini #1 released on November 15th offering readers an intriguing 1920's mystery story full of twists and turns. The book has some beautiful covers done by well-known artists such as David Mack (Daredevil, Kabuki) and Robert McGinnis (movie posters for James Bond and Breakfast at Tiffany’s). Minky Woodcock: The Girl Who Handcuffed Houdini takes readers into the next chapter of the comic line with an exciting adventure involving the famous Harry Houdini. In the story, we have the lovely Minky Woodcock who embarks on a mission to prove herself at her father's detective agency. 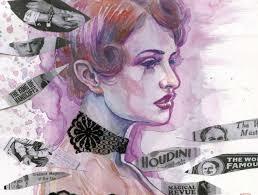 All-in-all, Minky Woodcock: The Girl Who Handcuffed Houdini is a fantastic read that takes players through an epic journey of discovery and magic. If you have been yearning for an intriguing read with an exciting plot twist alongside an immersive storyline, look no further with Minky Woodcock: The Girl Who Handcuffed Houdini.